is constantly threatened by expanding urban areas, removal of headstones, theft of objects, neglect, and lack of fences. If not recorded and cared for these reminders of early settlements could be lost forever. 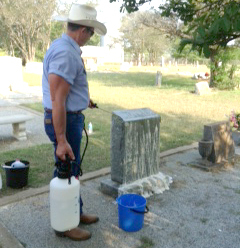 Gonzales CHC Cemetery Preservation Chairperson, Bradley Avant, has been spending these hot summer days working along with other volunteers at the Gonzales County Archives and Records Center. They are editing and updating the Cemetery Master List. Contacts: Bradley at cemetery@gonzaleschc.org or Pat Mosher, Director, Gonzales County Archives, archives@co.gonzales.tx.us about locating cemeteries in Gonzales County.